Line is subject to degradation with time from chafe and UV exposure, further this damage is not easily identified nor can be easily quantified. Trying to envelop such uncertainty would require you to use very large line (For example: 7/8 line to substitute 3/8 BBB chain) and even then frequent inspection would be necessary to insure line integrity. Thus is it is our recommendation to use chain as the primary rode when possible as it is more forgiving and durable. Line could be used as shock absorber in the form of a bridle or a snubber system and it is reasonable to extend the length of chain rode with line to accommodate deeper anchorages and/or increase in scope. 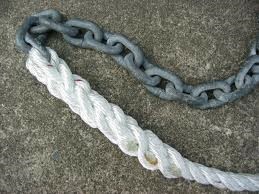 A typical cruising boat carries 300 feet of chain, which will give one 10:1 scope in 25 feet of water (5 feet allotted for freeboard height). This set up will ensure that most of the time you are anchored on chain and reduce the likely hood of rode failure. However anchorages deeper than 30 feet are plenty and it is often impractical to carry more than 300 feet of chain, in such situations it is important to use line that is appropriately sized and well inspected. The SWL is a guideline for the use of a rope in good condition for non-critical applications and should be reduced where life, limb, or valuable property is involved, or in cases of exceptional service such as shock loading, sustained loading, severe vibration, etc. The Cordage Institute specifies that the SWL of a rope shall be determined by dividing the Ultimate Tensile Strength of the rope by a safety factor. The safety factor ranges from 5 to 12 for non-critical uses and is typically set at 15 for life lines. Nylon and Polyester are similar in strength; however Nylon has more stretch for an equivalent size and plait. For this reason nylon is recommended material for a snubber/bridle line, and both are reasonable choices for anchor rode. When talking about rope construction, there are two general categories, twisted and braided. Twisted rope is formed by coiling three strands together in the same direction. The fibers within each of the three strands must twist in the opposite direction as the corresponding strands. Twisted rope hangs straight and resists kinking. The other type of rope construction is braided. 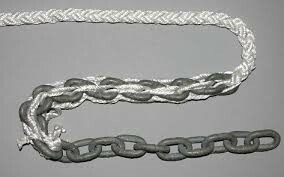 There are three different kinds of braided construction though, diamond braid with a core, diamond braid without a core (also known as hollow braid) and solid braid. Diamond braid is produced by weaving ends of yarn over and under. If there is a core around which the rope is braided, it cannot be spliced. If a core does not exist, the rope is called “hollow braid”. The leading feature of hollow braided rope is its ability to splice easily. Anchor line most commonly is offered in Twisted Three Strand, Double Braid, 8 Strand, 12 Strand Solid Braid. Braided ropes have many advantages over twisted three strand: they do not kink and are easy to coil/flake and they have less stretch. Thus when the entire length of the rode is line – sufficient stretch can be achieved with braided line. Three strand offers the best resistance to abrasion, and is more affordable. Three strand offers more stretch and is ideal for use in (bridle/snubber) application. The most important detail is to size the line appropriately for the expected loads on the rode.